Alan Oliveira WR 20.66 - Should he Run in Able-Bodied Olympics? Alan Oliveira WR 20.66 – Should he Run in Able-Bodied Olympics? Alan Oliveira ran a world record 20.66 for 200 meters (see video below at the end of this post). (1) At what point does drugs and supplements give an advantage to the athlete? (2) What is the fine line between legal supplements and banned drugs? I look at two cases… Tim Montgomery ran 9.92 as a clean athlete back in 1997, but ran 9.78 in 2002. Dwain Chambers ran 9.97 clean, then ran 9.87 coming behind second to Tim in that same race. If you do the math, that’s 0.14 and 0.10 seconds respectively. Advantage. At what point does technology take over from the natural (drug free) human body? Exactly two years ago, way before a trigger happy Oscar Pistorius killed an innocent person, I wrote the arguments on if Oscar Pistorius should be allowed to run in the Able-Bodied events, such as IAAF Diamond league meets, World Championships, and the Olympics. Paralympians do have a disadvantage, which is the start. They can’t accelerate as fast, thus 200 and 400m sprinters are forced to run negative or even splits. But one of the controversies, which is either an advantage or disadvantage is, do the artificial legs give an extra bounce (or whip) and increase stride length? I don’t know. 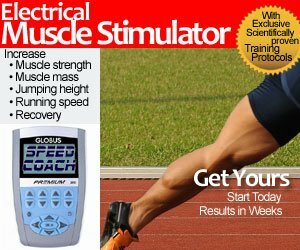 His calves will never fatigue (though we know it’s the hips and posterior chain that are usually the first to suffer Lactate fatigue in a 200 or 400 meters) but calf muscles, both eccentric and concentric actions, DO have an effect on the push off, stabilization and stride, hence possible Achilles tendon problems. He will never have an Achilles tendon problem. His ankles are stiffer, never tire, thus a longer ground contact time, which means more force can be applied to the ground. More force means a greater stride length. He will cover ground faster. You can’t argue that carbon fiber and titanium materials has changed the impact of sports for tennis rackets, golf clubs, and even hockey sticks. Stronger, lighter materials do increase performance. Sure, 20.66 won’t get you into the semi-finals, but I think there is a cross over point (eventually) where they will be equal. And that is when the able-bodies athletes will start complaining. How do we know Montgomery was clean when he ran 9 92? @Fabien, Tim said he started doping after Sydney 2000, or very early in 2001. I actually believe him. Looks like has has figured out the start better than the other runners. Calf play a significant role in sprinting. As they control foot action. Also looks like he has great control of the leg whip. The 2nd place guy doesn’t have the same energy flow as his leg are all over the place. I guess I forgot the obvious… IAAF A & B standards are 20.52 & 20.60. But he can still run if there is no one else with the standard from Brazil. They will get the standard, the money is in him getting the standard. But here is a video of his start, http://www.youtube.com/watch?v=8gHnJz-lxLg from a few years ago. In my opinion sprinting events (in particular) serve to scientifically determine the fastest athlete (on that day) and over long periods of time the collection of this data (results from these races over many decades) also charts the limits of human speed and endurance of these athletes…That said whether technology for Paralympians provides those athletes with an advantage or disadvantage over able bodied athletes in my opinion doesn’t really matter. If you consider these competitions as one grand scientific experiment, then you cannot allow a new variable into the experiment, as it will skew the results. It does not matter if this new variable has a built in disadvantage or advantage, ultimately it will negate the results of the experiment. Lets say (for argument’s sake) a Paralympian 100m sprinter is allowed to compete in the 2016 able bodied Olympics, and makes it to the 100m finals (marquee event) and has the race of his life and wins the 100m final in a new world record…Think about that for a second. What would winning that 100m final really tell us about this athlete? Will he then be considered the fastest athlete in the world? How much of that WR time was the athlete and how much was it the technology? I don’t know the answers to these questions, and I don’t know if these questions will ever be answered. Scientists are not particularly good at predicting the limits of sprinters, so how can they tell us with accuracy the amount of advantage or disadvantages the technology gives to the athlete. In order for the race to be as fair as possible from the starting line, each athlete should have equal access to the same technological advantages / disadvantages. Another thing is the blade length. The paralympics have allowed a longer length than the leg would otherwise be – with estimates and ranges of course in some cases – while to compete in the IAAF side Pistorius had to have his blades the same length as his legs would have been, and couldn’t change to the paralympic length without losing his IAAF status – hence Pistorius was soundly beaten by Oliveira and brought up the issue. Fair enough – if they can run incredible times with a slightly longer length and could go sub-20, that would really put the paralympics on the map. This advantage is not available to the one leg sprinters such as Peacock and Browne however, hence they are stuck with 10.80s (still fast, only 1 second off elite limits of performance and a second faster than I’ve ever run when I was competing as an amateur. I guess the issue is to make it as equal as possible – indeed the main issue is the balance of the start loss and end gain parts of the race. A shame we can’t make it totally equal and allow all to compete freely, but who knows what’s in store for the future as technology advances.